How to Let Go of Your Mad Baggage – Got angry teenagers? Here is the book on anger and what to do about it written for adolescents and grownups! Learn to contain unnecessary anger, release old angers and express your anger in ways that do not hurt others or yourself. Examine your own “withholds” and “below the belt fighting.” The metaphors given about the mads make the book light-hearted reading. However, it gives profoundly serious descriptions of what you can do with your own uncomfortable feelings. The humorous drawings give a light touch to the topic. The book gives ideas on how to let go of anger in safe and sane ways. Grownup Human Beings have anger too! 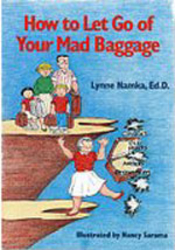 How To Let Go of Your Mad Baggage is the book on anger and what to do about it written for teenagers and grownups! Learn to feel and express your uncomfortable emotion and release old angers and express yourself without hurting others.